NEW ORLEANS » "The sun's out. It must be because Hawaii's in town." Hawaii-born bar and restaurant owner Lynn Sapir laughed over his comment because, after several days of overcast skies and rain, the winter weather in the Big Easy improved late yesterday morning as the sun finally broke through. 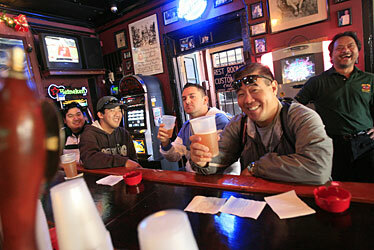 And, coincidentally, the first contingent of University of Hawaii football fans and support staff were arriving at his Johnny White's Pub and Grill on Bourbon Street in anticipation of the Warriors' game against the University of Georgia Bulldogs in the 79th annual Sugar Bowl. With Sapir throwing his support behind his home state's team, he and his right-hand man, Sonny Fisher, were starting to decorate the place by unfurling and putting out Hawaii and Warriors flags around Johnny White's second floor. They also were erecting support poles underneath the aged balcony for the many Hawaii fans they were anticipating to come during the next few days. 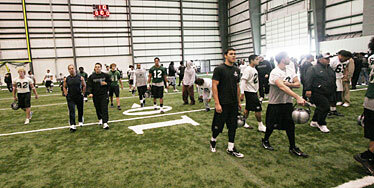 The University of Hawaii Warriors football team walked into the New Orleans Saints' practice facility yesterday for practice. 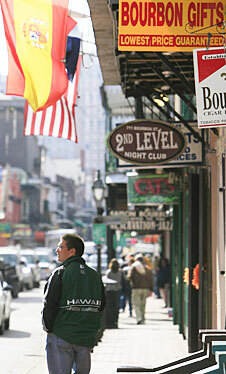 Meanwhile, UH fans were exploring the Big Easy. With a big "tailgate party" in the works for New Year's Day preceding the game, along with a scheduled appearance at the party from his Iolani School classmate Mayor Mufi Hannemann, Sapir said he has had a smile on his face for about a week now from the response via phone and e-mail from Hawaii fans who will later flock to his bar for a little local - and "N'awlins" - hospitality. "I'm hoping we can accommodate everybody," he said. "And I guess this (Louisiana State University) graduate who's a banker heard about our tailgate party, because he wants to do the same thing here, only in purple and golden, for his 200 friends for the game against Ohio State in the championship game Jan. 7." Johnny White's Pub and Grill owners Lynn Sapir and his wife, Jeaneen, stood near their balcony yesterday in the French Quarter of New Orleans. While Sapir appreciates the added business this busy tourism period brings, he plans to "empty out the kitchen" for Hawaii fans at their party, as cook Kenny Kolb prepares a buffet filled with standard Cajun and Creole fare. In the meantime, some guy in a UH Warriors jacket is taking snapshots from the street of the flag-festooned building. 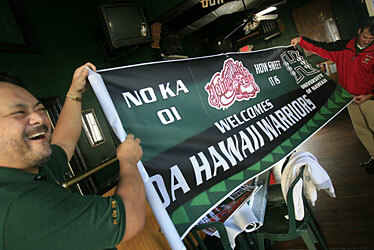 Johnny White's unfurled one of many Hawaii banners with the help of Dan Kirkley. John Almarez of Aiea flew from Honolulu to Los Angeles to New Orleans, all on standby, plus found a hotel room near the Louisiana Superdome. "I came by to get a photo of this place because I heard the guy was from Hawaii." Almarez will be attending the game with friends from Alabama. Sapir took on the role as greeter when members of the Warriors' team support staff came by for a drink or two later that day. UH band equipment managers George Matsumoto, Will Thomson, David Higa and Blayne Tamashiro came in the first charter flight with the team, along with flight mechanics Dwayne Hirata and Eric Nishijima. Aiea resident John Almarez wore his Hawaii Warriors jacket while strolling Bourbon Street yesterday in the French Quarter of New Orleans. With the rest of the band coming in tomorrow, the equipment managers decided to visit Johnny White's ahead of their compatriots to check out the place deemed Warrior Fan Central. "It means drinking earlier, but it's OK to take one for the team," joked Matsumoto. 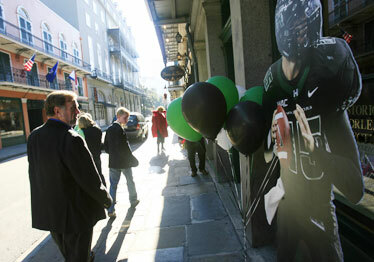 Pedestrians walked by a large cardboard cutout poster of UH quarterback Colt Brennan yesterday on Royal Street in the French Quarter. UH fans from Morrison, Colo., Gary and Natasha Laflin have transformed their love for the islands as a wedding anniversary destination into avid support for the UH football team. "What I like about the Warriors is their tenacity," said an enthusiastic Natasha Laflin, a former New Orleans resident. "They're going for the gusto. It's fantastic." 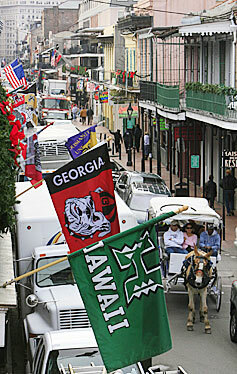 Both University of Hawaii and University of Georgia flags waved above Bourbon Street. "Even if Hawaii loses," Nishijima said, while loudly knocking on the bar's wooden countertop in hopes it will be otherwise, "we're just happy to be here. It's just as good as a win."